A tumor is an abnormal growth of tissue. Also known as a neoplasm (meaning "new formation"), a tumor can be either benign (not serious or harmful) or malignant (cancerous or deadly). Either type may require therapy to remove it or reduce its size. It is not known what triggers a tumor's abnormal growth. The body normally creates cells only at a rate needed to replace those that die or to aid an individual's growth and development. The growth of a tumor, however, is unregulated by normal body control mechanisms. 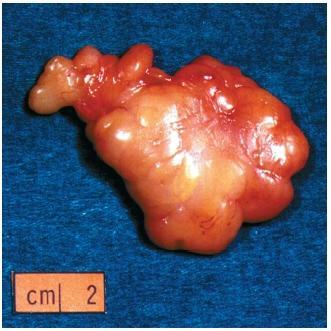 A benign tumor is a well-defined growth with smooth boundaries that simply grows in diameter. This can be harmful if the tumor compresses the surrounding tissue against a hard surface in the body. A benign brain tumor that compresses brain tissue against the skull or the bony floor of the cranium can result in paralysis, loss of hearing or sight, dizziness, and other ailments. A tumor growing in the abdomen can compress the intestine and interfere with digestion. It also can prevent the proper functioning of the liver or pancreas. The benign tumor usually grows at a relatively slow pace and may stop growing for a time when it reaches a certain size. Benign: A slow-growing, self-contained tumor that is not seriously harmful. Biopsy: The surgical removal of a small part of a tumor, which is then studied under a microscope to determine whether it is benign or malignant. Chemotherapy: Use of powerful chemicals to kill cancer cells in the human body. Malignant: A usually fast-growing, often fatal tumor that invades surrounding tissue and sheds cells that spread throughout the body, creating new tumors. Metastasis: Spreading of a cancerous growth by shedding cells that grow in other locations. Radiation therapy: Use of radioactive substances to kill cancer cells in the human body. A malignant tumor may grow quite rapidly and can be fatal. It usually has irregular boundaries and invades the surrounding tissue instead of pressing it aside. Most important, this cancer also sheds cells that travel through the bloodstream, starting new tumor growth at other locations in the body. This process is called metastasis (pronounced me-TAS-ta-sis). 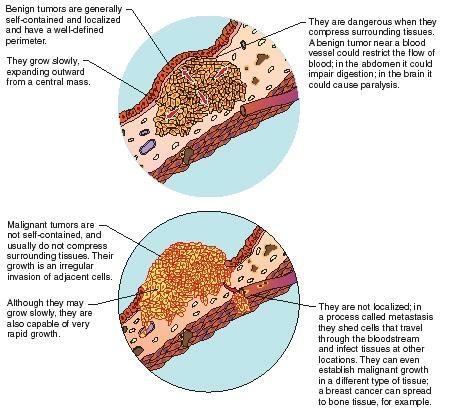 The cancerous cells can establish a cancer in tissue that is different from the original cancer. A breast cancer could spread to bone tissue or to liver tissue. Benign tissue is distinctly different from cancer tissue. However, it is difficult to determine whether a tumor is benign or malignant without surgically removing a sample of it and studying the tissue under the microscope. This sampling is called a biopsy (pronounced BY-op-see). A benign tumor can be removed surgically if it is in a location that a surgeon can reach. A tumor growing in an unreachable area of the body can be treated using radiation (by which the patient is administered radioactive substances that target a specific area and destroy cells there). Another method is to insert thin probes into the tumor and freeze it with liquid nitrogen. This operation is called cryosurgery (pronounced cry-o-SUR-jer-ee). to kill any stray cells. This treatment is called chemotherapy (pronounced key-moe-THER-a-pee). I WOULD LIKE TO SEE PICTURES OF A BENIGN OVARIAN TUMOR? I have a friend that had a tumor on her thyroid, the biopsy would not determine for sure if the tumor was cancerous. They decided to remove the tumor and part of the thyroid, saying that if they tumor was cancerous they would probably take the other half of the thyroid. The surgery went well, they took out the tumor and found no cancer. However, they took half of the thyroid, and now my friend is very angry that she even had it removed because it turned out not to be cancerous. Were they wrong to take it out. It grew slowly over years, and sometimes it gave her a little pain. Can you tell me anything that might help her view of the situation, or should she be taking action against the Doctor who insisted on taking out the tumor? I'm assuming they had reason to believe the tumor was dangerous, but I'd love some information that might help her calm down, and realize it was for the best. I went to the doctor a few days ago and he told me that I have a benign tumor on my uvula but all he did is look at it... Should I trust him or should I request a biopsy? i have two or three swollen up portion in my hands for a year or two. is it tumor?what test can approve it? i have a benign tumor in one of my salivary glands under the left ear, and it has gotten more painfull but i will be having surgey soon, this article help me with what a benign tumor means as i got worried so i researched it and now it has calmed me down knowing that its not cancerous. I HAD ONE BENIGN TUMOR REMOVED FROM MY NECK SOME YEARS AGO AND NOW I THINK I MAY HAVE ANOTHER ONE GROWING IN MY ABDOMEN DO YOU THINK THIS IS POSSIBLE. I HAVE BEEN VISITING HOSPITAL FOR THREE YEARS BECAUSE OF BEING IN CONTINUAL PAIN WHICH IS GRADUALLLY GETTING WORSE. I HAVE HAD ALL THE RELEVENT TESTS EG.HIP XRAY, CT SCAN, ULTRASOUND AND NOTHING ABNORMAL HAS SHOWN UP. I HAVE SUGGESTED TO CONSULTANTS THAT I THINK MAYBE I COULD HAVE ANOTHER BENIGN TUMOR GROWING BUT I SEEM NOT TO HAVE BEEN TAKEN SERIOUSLY AND THEY ALL SEEM RELUCTANT TO LET ME HAVE AN MRI SCAN. I AM 67 AND FEEL MAYBE THAT THEY THINK I AM MAKING A FUSS ABOUT NOTHING BUT I KNOW SOMETHING IS WRONG. I had a breast biopsy 2 years ago. I was very unhappy with the facility that performed the biopsy so I changed facilities. The new facility had the old records for comparison - but since equipment and radiologist differ, I turned down another suggestion for a biopsy in the same region one year later when again they said that sight is suspicious after the follow up ultrasound and tighter mammo. I turned it down to wait until my next routine mammo and today I was told that this same site warrants a more specific mammo and ultrasound. I have had NO problems. It has been two years since the BENIGN biopsy, with three normal biopsies prior to that episode. I am beginning to wonder why concentrate on a site that has been found to be benign and if i am being swindled? I never even felt a lump until AFTER the biopsy. That area is the same now as it felt 3 months after the biopsy. I am seriously considering quitting these mammograms altogether because I think benign has been the result of their area of concern. Can you tell me if or why they should be still concentrating on an area that already was cleared? Wouldn't having breast cancer show up in some other way if you had a bogus benign result and truly had cancer liek with growth or change in texture or movement? HI MY NAME IS WENDY AND I WAS DIAGNOSED 3 WEEKS AGO WITH A BENIGN BREAST TUMOUR. I HAVE NOW FOUND ANOTHER LUMP NEXT TO IT. VERY WORRIED AS ITS GROWN IN SUCH A SHORT TIME. I WOULD APPRECIATE ANY HELP OR ADVICE ON THIS. I AM 49 YEARS OLD, PRE MENOPAUSE. I have a some extra mass like a tumor, in my back side.Its grow slowly and its have no pain also,some said that its from Neuron cords.It can feel physically.Please suggest is it tumor?also I have no such problem like weight loss, appetite,pain on that part. Please help me. This is for my father in law who is under testing of cancer treatment. He was gone for all test and nand not yet confirmed for treatments.He has a tumour on the back side behind the left shoulder.Doctor said he should go for raradiological biopsy and will go for treatment.Now he is at home suffering back pain and leg pain.He is dated for biopsy after 5 days. So what to do & are these symptoms are showing he is in severe stage? Thank you for this forum. I have been clear of soft palate cancer for 6 years. For about three to four weeks I have noticed an accumulation of what feels like rough dead skin on the roof of my mouth. I saw the dentist yesterday and he has urgently referred me to the mouth cancer clinic. My GP had a look at it today and said it was a "3 millimetre lesion". Could be nothing but I should see the cancer clinic asap for a biopsy. Now I'm dreading a maxillectomy, and goodness knows what. Can you shed any light on my situation please? I have horrors of mouth biopsies and the experience 6 years ago. I have a tumor on what appears to be on my left parathyroid/thyroid that measures 5x3x7. No biopsy. A sistambi (mispelled)nuclear imaging, along with sonogram, c.t. scan w w/o contrast, and mri. My endocrinologist suggests that no testing out there can locate exactly where the tumor is located. Either parathyroid or thyroid. She is contradicting everything my surgeon, nephrologist, and neurologist are saying. They believe it needs to be removed as it restricts my swallowing and breathing. I have to sleep at 45 degree angle or it feels as if I'm being choked. But she says treat it with medicine. Huge tumor. My pth level was 107. 3 days later it jumped to 165. my calcium was 8.4 and it moved as well to 8.8in those 3 days. Although my calcium is low, apparently it doesn't go hand in hand with a parathyroidectomy. And she refuses to sign off of my surgery. She did however refer me to her team of surgeons to have the small tumors collected on my right thyroid, as she did do a biopsy, and they came back benign. She says they will need to be removed. So thyroidectomy on right but not on left. I don't understand.